Private equity and venture capital (PE/VC) fund managers are under growing regulatory pressure. The new asset management rules issued by top banking and securities regulators aim to push uniformity in regulation, which will have a major impact on the activities of domestic PE/VC institutions. 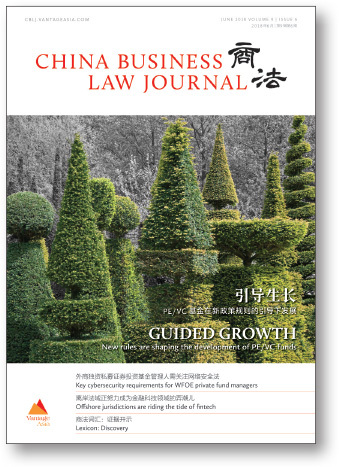 Guided growth probes the latest rules and compliance issues, while discussing new opportunities as China’s capital reform deepens. The new rules intend to shatter rigid payments, prohibit fund pools, stop channel business and eliminate risks, which further increases the requirements on both investors and fund managers. While beefing up regulation, the government is also incentivizing funds to shift their investment from the virtual to the real economy. As part of efforts to open up the financial sector, the government has further advanced the QDLP and QDIE pilot projects by recently lifting the pilot limits in Shanghai and Shenzhen to US$5 billion each. The policy will have a direct benefit on the cross-border investment of PE/VC funds. China is also opening up its domestic private fund business to foreign investors. Up to May 2018, 11 wholly foreign-owned private fund managers (WFOE PFMs) had been authorized to carry out private fund management business in Mainland China. However, these PFMs should be watching more than just financial regulations. Testing the defences points to key requirements of the Cybersecurity Law, which took effect on 1 June 2017. The law, followed by a series of supporting rules, carries extensive influence over many sectors, including WFOE PFMs. The PFMs need to be aware of the obligations to protect personal information, restrictions on exporting data, data retention requirements, the scope of commercial use of VPNs, and the use of encryption technology. Localization of IT policies, improved risk assessment and due diligence are more indispensable now than ever. New wave looks at offshore jurisdictions that play an important role in the overseas investment of Chinese companies. In the past few years, offshore jurisdictions have been adapting themselves to global regulatory pressure, especially with regard to tax transparency. Now many of them are racing to be the next fintech hubs. On the regulatory front, for example, Bermuda recently introduced new acts to provide legal frameworks and regulatory certainty for business activities centred on blockchain, virtual currencies and other digital assets. In addition to fintech, offshore jurisdictions are updating their regulations in other areas to keep their business environment attractive. The Limited Partnership Act of the British Virgin Islands (BVI) is one example. Others are ensuring they comply with global regulatory demands for transparency, as per the revised version of Anti-Money Laundering Regulations that took effect in the Cayman Islands in October 2017. This report looks at the latest developments of offshore destinations including BVI, Cayman, Cyprus, the Isle of Man, Jersey and Guernsey.